For all the new brides as well as married ladies! Here are 20 amazing lehengas to choose from as your Karva Chauth attire! With Karva Chauth round the corner, there is already a lot of excitement among women – especially those who have just tied the knot – to not just fast for a happy married life and longevity of a husband, but also to make a style statement with their choice of outfit. This anticipation of putting the wardrobe together and dressing up perhaps takes away from crabby moods due to lack of water and food. Women sometimes wear their bridal ensembles for this occasion. Some others don heavy sarees. You can experiment with ensembles other than your bridal outfit too! Lehengas, are a perfect festival outfit. But this need not mean you need to burn a hole in your pocket to put your ensemble together. Put your imagination to use and try various combinations when it comes getting a custom-stitched lehenga. You could for instance, use up a Bandhani or lehriya saree and pair it with matching choli and dupatta. If you think your wedding lehenga is too blingy, simply wear the skirt with a solid color top or blouse. A contrast color blouse tends to offset the bright colors considerably. Red and maroon are the classic colors for this day, accentuated with gold and bling. A vibrant green lehenga with a red dupatta is a great way to interpret the traditional. Apart from the traditional red, you can also go for lighter shades such as yellows, pinks or corals and peaches. If we are to go by what fashion pundits are saying, the colors in vogue will be scarlet, maroon, mustard and emerald. Other colors like pink, sapphire, and gold will also work well. If too many colors confuse you, wear an ombre-colored lehenga to add drama. You can also let you kalidar lehenga make a statement by pairing it with a solid kurti/ choli. The draping of a dupatta leads you to wearing a simple lehenga in many ways. Drape it like a saree by wearing the dupatta as a pallu. A maxi-lehnga – a one-piece floor length dress, with minimal make-up also looks graceful. 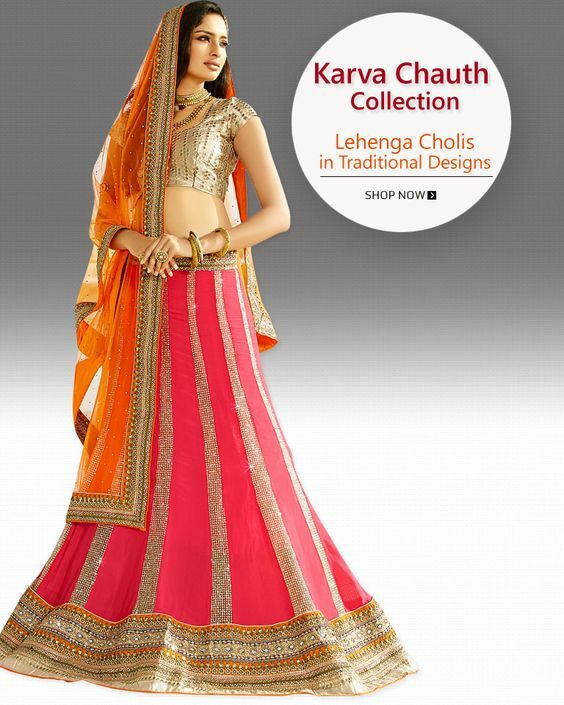 Flared lehengas are also a great option to wear at Karva Chauth. A boat neck choli will go perfectly with a flared lehenga. In terms of embellishments, mirror-work is in vogue. Wear a mirror-worked lehenga for this Karva Chauth. It is a traditional embroidery technique where, tiny mirrors are used to adorn the fabric using stitches. A heavy embellished printed silk or satin lehenga also looks fresh (and you get a lot of wear-ability too). Use our mood board of the best uber-cool lehengas for Karva Chauth and be a head turner!